I seem to spend a fair amount of time on this blog whinging about the weather and, in particular, the heat. In the build up to Christmas in Australia, along with the stress of buying presents and the preparing and over consumption of massive amounts of food, comes with an added bonus of extreme heat and everyone madly finishing up work and school, so we can to kick back into summer holidays with everything finished (so you theoretically don’t even have to think about work at least for the first half of January). One of my new year’s resolutions may well be to try and stop whinging about the heat but I suspect this may be difficult because when it’s hot in Australia its very, very hot. On a more positive note, December in Sydney also signals the beginning of picnic season and in the weekends leading up to Christmas, the parks and beaches around Sydney are often surprisingly uncrowded (everyone is too busy out shopping). Last Sunday, I made these corn cakes to take on a picnic in Nielsen Park and in amongst all my grimping and grinching about Christmas in Australia, I took a moment to stop and reflect on what a spectacularly beautiful city Sydney is and celebrate the good things about our Australian Christmas. While the northern hemisphere is huddled around fires celebrating their traditional White Christmas, we are enjoying a smorgasboard of summer foods, swimming and buying boxes of mangoes and cherries (mango and cherry season is worth celebrating for itself). So even if I don’t keep my new year’s resolution and stop whinging about the heat, at least I will try embrace some of the good things about our Australian summer and holiday celebrations. 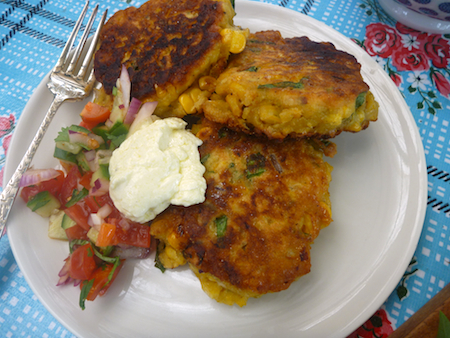 I often make these corn cakes for a light dinner but corn cakes or, indeed, any kind of fritter makes great picnic fare. Over the years, I’ve made a lot of different corn fritters, including a more Asian-style fritters with rice flour in the batter (rice flour makes your fritters very crispy). 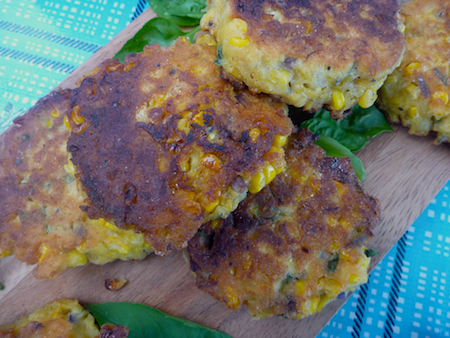 These corn cakes just happen to be my favourite ones to make at the moment and I like them particularly because they use cornmeal and buttermilk, which gives them a nice heft, making them like a cross between a corn fritter and cornbread. I made this recipe quite a few times and kept adding an extra egg or more buttermilk, because the batter just seemed too thick – then I realised the batter was probably meant to be quite thick and you just have to pat it into shape a little bit after you spoon it into your frying pan. 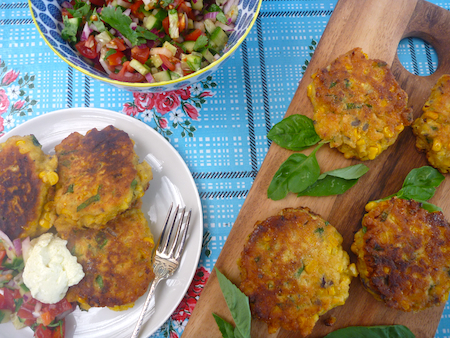 I serve these corn cakes with a simple fresh salsa – which is usually made up of what ever herbs or veggies I have around and dressed with some lime or lemon juice. 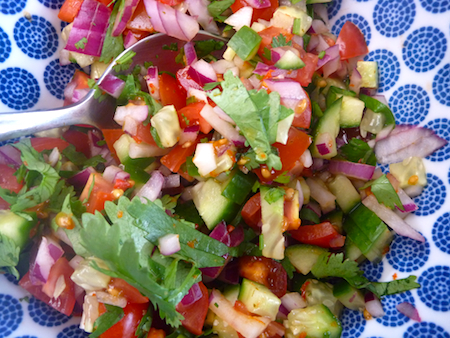 This one was simply made up of tomato, cucumber, coriander and red onion and dressed with some lemon, hot sauce, salt and pepper. 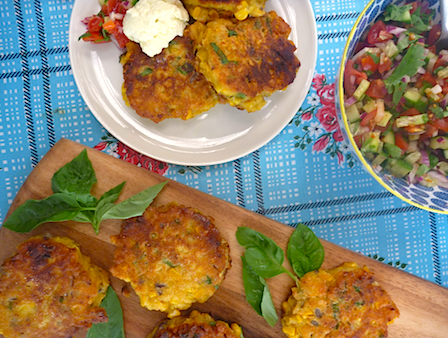 The fresh salsa really perks up these corn cakes but but we’ve taken to eating these with whipped feta, which takes the whole thing onto another plane of deliciousness. If you are making these corn cakes to eat warm, preheat your oven to 100°C and line a baking tray with paper towel. Slice the corn kernels from the cob into a large bowl. I slice half of the kernels off in the first slice down the cob and then the rest of the kernel off in the second slice to the cob. Scrape the striped cobs with the back of the knife to release the juices into the bowl. Add cornmeal, onion, basil, baking powder, salt and pepper to corn and mix well. Add eggs, buttermilk and butter and mix until just combined (do not overmix). In a large frying pan or skillet heat oil over medium heat until very hot. Scoop a couple of heaped tablespoons of batter into the pan and pat down into shape. Cooking in batches of three to four, fry corn cakes until golden brown. Drain on paper towels and place in oven to keep warm if desired. Serve with fresh salsa and whipped feta if you possibly can. Let me know how the vegan version goes.